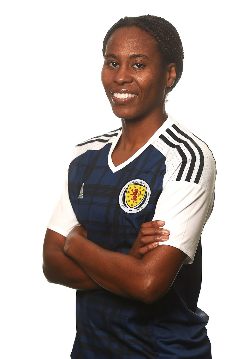 Vittsjö GIK star Ifeoma Dieke earned her 121st cap as Scotland were hammered 6-0 by England, in a game dubbed the Battle of Britain at the 2017 UEFA Women's Championship, on Wednesday night. The experienced central defender, who wore the number four jersey, started and completed the game for Scotland. The Lionesses were three goals up at the break, courtesy of Arsenal star Jodie Taylor's brace and a strike from Ellen White . Taylor grabbed her hat-trick seven minutes into the second half to make it 4-0, and the scoreboard didn't change until the 87th minute when Jordan Nobbs netted England's fifth goal, Barcelona's Toni Duggan added more gloss to the scoreline in stoppage time. Dieke and her teammates next play Portugal on Sunday, July 23 before rounding off their Group D campaign against Spain.